Slashed Pro Is The Ultimate Cut & Restored Rope Routine! Slashed Pro Is An Absolute Reputation Maker! Slashed Pro Is Six Minutes Of Incredibly Funny, Dynamic and Powerful Magic! Slashed Pro Is Easy To Do…Anyone Can Do It! Slashed Pro Is Practical. It Packs Flat, Plays Big And Resets Instantly! You NEVER Actually Cut The Rope! Years ago Slashed took the Magic World by storm. Scott created Slashed by combining the existing knowledge of rope magic and weaved the best moves together to form the base for Slashed. Mix in new moves and gaffs. Then add over a year of testing and fine tuning through hundreds of performances for live audiences. This process polished Slashed into a gem that is the ver best cut & restored rope routine for professional performers ever invented! The original version of Slashed was released exclusively through Bob Kohler Magic and immediately it became the new benchmark. Slashed took off and found its way into the acts of hundreds of pro performers. Unfortunately the rope we used to build Slashed became unavailable in just a few moments when a hurricane wiped the factory off of the planet. Slashed was instantly unavailable…until now! The Gaffed Rope is the hear of Slashed. It requires rope that meets our exacting standards. From the beginning, Scott and I wanted to build a rope routine that used the same rope over and over for every show. Carrying extra rope around the world is heavy and not an option for us. So we created a Cut & Restored Rope routine where you never actually cut the rope. Finding the perfect rope was a major challenge. The rope had to be the correct color, the right flexibility and it had to be able for us to gaff so that “the work” is invisible to the audience. It’s taken us many years for us to find this new rope for Slashed Pro. The good news is we finally have it. With Slashed Pro you get two powerhouse routines. Slashed Pro includes both the original routine that Scott performed for the first release of Slashed years ago. It is a hilarious, talking version of the routine. 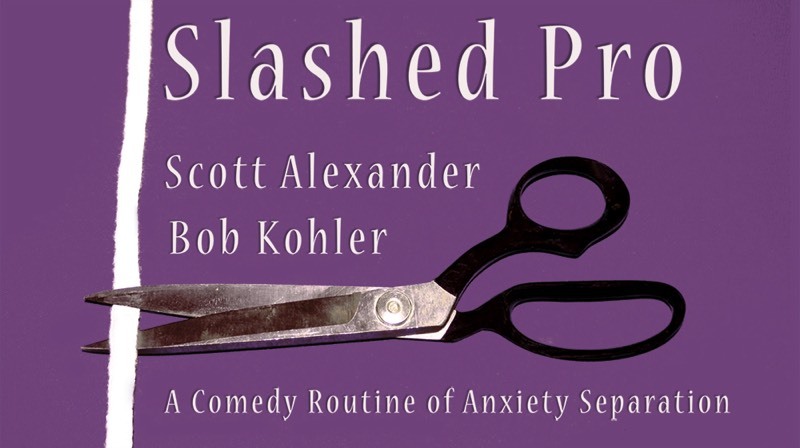 Over the years Scott has continued to perform Slashed and new version “Slashed Pro” combines comedy delivered by the spoken word cleverly woven into the perfect music that takes Slashed to new heights! Slashed Pro has become a monster routine that is a polished masterpiece. Slashed Pro is really easy to perform. To make the training direct and easy to digest we’ve broken the routine into four sections. Each section is complete on it’s ow which allows the performer to build the routine into any order of their choosing. The handling is covered in extreme detail from both front, side and back views so you can easily see each and every move. It’s easy to see exactly how to do the routine. The Slashed Pro video training is delivered by instant download when you place your order. You will have the training instantly so you can start the learning process while you wait for Slashed Pro to arrive. The video is delivered in HD 720P. The training is 44 minutes in length. Slashed Pro has two performances. There a performance of the original version of Slashed shot live inside a cruise ship theater. The Slashed Pro performance was shot live in the Parlor of the World Famous Magic Castle. The Inner Secrets of Slashed Pro are covered in incredible detail you've come to expect from Bob Kohler Magic. For protection of your investment the video is embedded with each owner's identity. Please read the License section for details. All purchasers should be aware that their identity is permanently embedded with the video download. After your purchase you will receive an e-mail verifying availability. In backorder situations the purchaser agrees that the order cannot be cancelled after the training video has been downloaded. Downloading the video training establishes receiving the product. Bob Kohler Magic will contact you within 48 hours if your order will be backordered with an estimate for delivery. Slashed Pro is designed for professional performers. It is our intention to protect your investment in Slashed Pro. When you purchase Slashed Pro you are paying for two items. First is the rope. Second is the performance license. The Slashed Pro rope and License are a single product. It's is yours to use and perform until the guidelines below. If you ever decide to sell Slashed Pro please understand that you are selling both the Slashed Pro and License. After sale you no longer have the right to perform Slashed Pro routine. All legal owners of original copies of this routine have the right to perform this presentation in non-recorded, non-broadcast, live performance settings only. demonstrate, display, vary, translate or discuss these methods or presentation. All broadcast, narrowcasting, cable, internet, intranet, YouTube, or use in a lecture, speech, talk and/or any and all other uses are strictly withheld by the authors and permission for all other uses throughout the universe by anyone other than the authors must otherwise be obtained in writing from Bob Kohler first. Slashed Pro is personally hand made by Scott Alexander. We do our best to keep Slashed Pro in stock but due to Scott’s performance schedule and travel occasionally we may not be able to keep up with the demand. If you would like to check on availability of Slashed Pro before purchase please write to: bobkohlermagic1@gmail.com. We will respond ASAP but please be advised that sales on the internet are instantaneous. It is possible we will advise you Slashed Pro is in stock but in fact our stock is sold out before your purchase. We are not responsible for any backorder situation.